Northern constellation Cygnus is one of the most prominent constellations on the plane of the Milky Way. This spectacular photo was taken by photographer Josh Knutson of Rio Rancho, N.M., in April 2012. The northern constellation Cygnus and two nebulas named after North America and a pelican come into brilliant focus as part of astrophotographer’s Milky Way mosaic. Skywatcher Josh Knutson captured these spectacular images from Rio Rancho, N.M., on April 22. “This has always been a fascinating area of the sky to me with so many nebula targets, supernova remnants, double/triple star systems, and of course the Milky Way,” Knutson said. The North American and Pelican nebulae are parts of the same interstellar gas complex that lie about 1,800 light-years away. A light-year is the distance light travels in one year, or about 6 trillion miles (10 trillion kilometers). 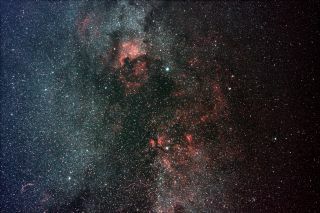 Cygnus, the Swan nebula, is one of the most prominent constellations on the plane of the Milky Way. The North American and Pelican nebulas are parts of the same interstellar gas complex that lie about 1,800 light-years away. While the exact distance of this nebula complex is hard to determine, the nebula complex is more than four times larger than the moon. Nearby Cygnus’s Wall makes up the southern part of the North America nebula and contains one of the highest concentrations of star formations in the region. “It makes for quite the view both photographically and visually,” Knutson said. Editor's note: If you have an amazing skywatching photo you'd like to share for a possible story or image gallery, please contact managing editor Tariq Malik at tmalik@space.com.